If you own a deck, then you already know the peace of enjoying the outdoors in the comfort of your own backyard. If you don’t own a deck, then you have come to the right place! As you design your ideal deck, there are a few items to consider. Not only should you think about the aesthetic value of your deck material, but you must also consider the way the material feels to walk on and how much time you will spend taking care of it. Today we’re going to be discussing two common types of deck material that you can choose from as you design your ideal deck. Let’s jump right in. Natural wood offers a sophisticated deck experience. There is something effortlessly elegant about natural materials. Cedar and Redwood are the most common types of natural wood and both offer a certain level of sophistication. Cedar is yellow in color and feels nice to walk on in bare feet. Redwood is, of course, reddish in color and it also offers a pleasant surface to walk on. Each of these woods should last about twenty years with proper care. Not only that, but the natural oils in the wood help to protect against rot and insects. 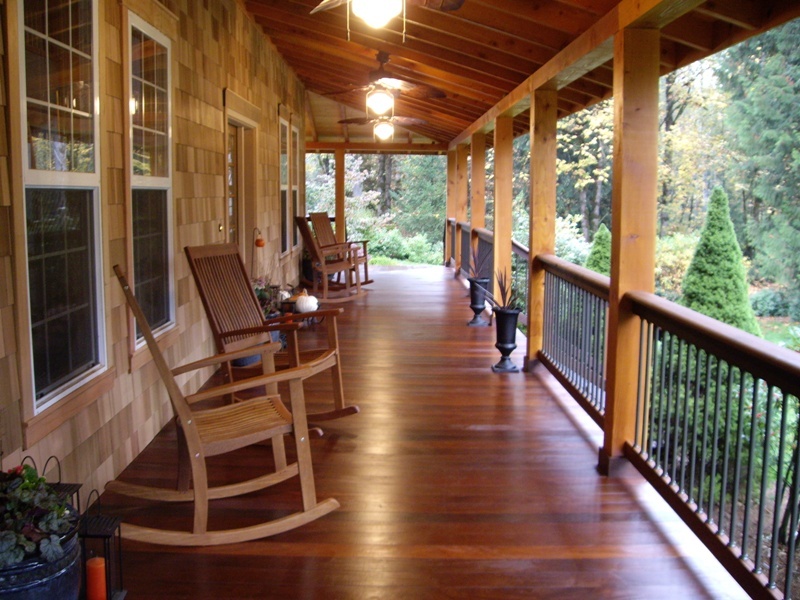 Using the proper stains and seals will also help to ensure a long, healthy life for your deck. Now, if you’re looking for a deck material that requires a little less maintenance, then read on. Composite deck material offers a low-maintenance alternative. For some of us, the hustle and bustle of daily life doesn’t leave much time to maintain a deck. Composite decking provides the perfect solution. It is made from recycled plastics and wood fibers to create a strong, resilient material. Composite decking won’t warp or splinter with age and won’t require stains to keep it looking its best. Composite materials come in a variety of colors so that you can create the deck that fits the palette of your outdoor space. You should note, however, that composite decking rings in at a higher price than its natural alternative. It’s all about designing the space that fits your needs. No matter what kind of decking material you’d prefer, the help of a professional is what you need to make the most of your new deck. We can help you answer the tough questions about your new deck and even help you pick out the perfect material. Give us a call when you’re ready to enjoy your new deck and we’ll open your eyes to the possibilities. This entry was posted on Saturday, March 23rd, 2019 at 2:07 am. Both comments and pings are currently closed.